Chief Rabbinate complains to police for incitement to the murder of Rabbi Yitzhak Yosef by Hamas terrorists. 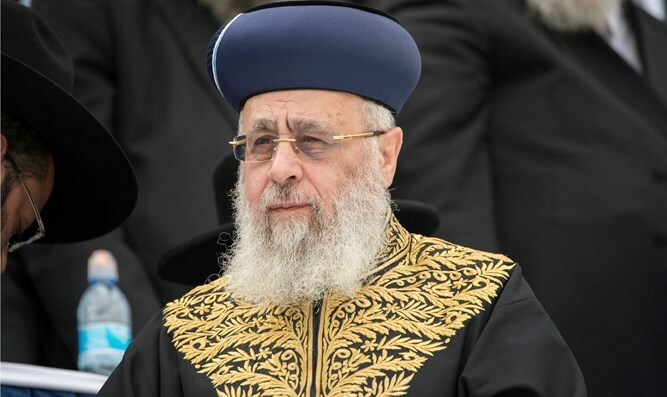 The Chief Rabbinate on Wednesday filed a complaint with the police over incitement and threats of murder, after leaflets were published in Gaza calling for the assassination of the Chief Sephardic Rabbi of Israel Rabbi Yitzhak Yosef, MK Yehuda Glick (Likud), former MK Moshe Feiglin and other rabbis. In addition, Religious Services Minister David Azoulay (Shas) requested that Public Security Minister Gilad Erdan (Likud) provide the Chief Rabbi with security detail until the security threat is removed beyond any doubt. In his letter, Minister Azoulay wrote that action must be taken quickly to ensure the safety of the Chief Rabbi. "I would request that action be taken as soon as possible to clarify the threat with the relevant parties and to ensure the immediate security of the Chief Rabbi of Israel until the threat is removed," he wrote. The inciting leaflets distributed on Tuesday night by the military wing of the Hamas terrorist organization included a picture of the rabbi alongside a picture of MK Glick and of Feiglin.